Give your E92 non M a new classic BMW aggressive look with these E92 Lumma Style Side Skirts. Complete your E92's aesthetic makeover with our E92 Lumma Style Side Skirts. The E92 Lumma Style Side Skirts are made out of Polypropylene, a very durable and ridged material that is used to make the factory body kit. 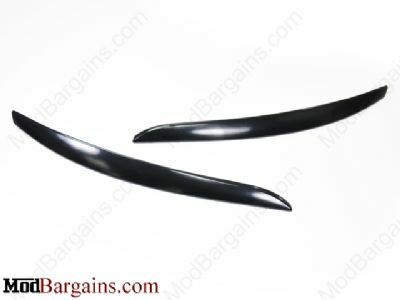 This ensure your E92 M3 Side Skirts are OEM quality and will NOT crack or deform. These E92 M3 Side Skirts come with all necessary hardware needed for installation. Every pair of E92 M3 Side Skirts before leaving are tediously quality checked to make sure your E92 Side Skirts are perfect. No need to worry about fitment issues with these Lumma Style Side Skirts, they will fit perfectly and flush with your E92's stock fenders and hood. Give your E92 the look of an euro tuner with our all new E92 Lumma Style Side Skirts. Originally my plan was to just go to Disneyland in LA as my girlfriend insisted, but I thought to myself "wait a sec! isn't Modbargains also located near LA?" So I decided to hit up my GPS and route to Modbargain's address and BAM! 24 mins away from Disneyland resort! I hit up with Alan unexpectedly, and I was warmly welcomed in their facility, he invited me in for a seat and we had a little nice chat. I originally intended to just buy the GP Thunders, but I thought to myself such a long trip to Modbargains and I would just walk out with a set of GP Thunders? LMAO! So I asked for the price of the M3 sideskirts! and WHAM! What a DEAL, so I got myself a pair. They look authentic and feels like its made from quality material that I can trust on. All in all, it was nice meeting you IRL Alan! Nice to see the face behind the user lol! Ordered the e92 M3 Side skirts (For NON-e92 M3), i must say the BEST customer service, honesty, and def worked with me to meet my needs. Sometimes you read some feedback on here, and your thinking ok well that's just a bit storyline but that's not the case here at all. ALAN you are getting ALL of my business for the future, thank you and Modbargains VERY much. What does this kit include?